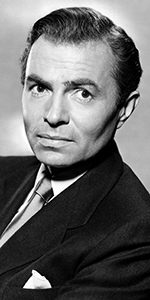 James Mason was a very popular leading man of British and American films. With his distinctive voice and riveting presence, Mason scored in a number of classic films. Born into comfortable circumstances in Yorkshire, young James attended Marlborough College, then graduated in architecture at Peterhouse, Cambridge. Despite this rather patrician experience, Mason veered toward the stage, appearing in local productions while still in college. He made his stage debut as the character Aldershot in the play The Rascal in 1931. Joining the Old Vic theatre in London brought him into the orbit of Tyrone Guthrie, who taught the young actor a thing or two. Mason was plucked from the Vic to do a small role in the film The Private Life of Don Juan in 1934, but the director, Alexander Korda, replaced him with another actor after only three days on the picture. The state of the British film industry was on an upswing, as the British government required British theatres to show 20% British-made films. The resulting low-budget films were called "quota quickies," and James Mason appeared in several of them before 1938. Mason managed to bring out his screen persona in films like Father and Son (released in May, 1936), The Mill on the Floss (released in December, 1936), The High Command (released in March, 1937), and The Return of the Scarlet Pimpernel (released in October, 1937). As Britian entered World War II, Mason broke with his family, registering as a conscientious objector. His tribunal offered him non-combatant service, which he refused. Considering his reputation in films, it was decided that Mason could fulfill his obligation by working in films. Mason became quite well-know for a series of films done for the Gainsborough studio: Hatter's Castle (released in February, 1942, with Deborah Kerr, The Man in Grey (released in August, 1943) with Margaret Lockwood, and A Place of One's Own (released in May, 1945). Mason scored an international success with The Seventh Veil (released in November, 1945). He followed this up with a classic protrait of a crook under the gun in Odd Man Out (released in January, 1947). Mason was brought to Hollywood and made his first picture at M-G-M, Caught (released in February, 1949) with Barbara Bel Geddes and Robert Ryan. Mason liked working in Hollywood, and Hollywood liked Mason; he played German Field Marshall Erwin Rommel in The Desert Fox (which played the Chinese in October, 1951), and again in the film The Desert Rats (released in May, 1953). While living in Hollywood, Mason bought the fomer home of Buster Keaton. There were several "lost" films stored in the house, so Mason paid to have the films restored, one of which is the short The Boat (released in November, 1921). Mason appeared in director Joseph L. Mankiewicz's 5 Fingers (played the Chinese in April, 1952), and worked for the director again as Brutus in M-G-M's Julius Caesar (released in June, 1953). Mason undertook a role in the very early Fox CinemaScope production Prince Valiant (which played the Chinese in April, 1954), just a few days after co-stars Janet Leigh and Victor McLaglen helped him make his imprints on a rainy evening (probably the only rainy footprinting we know of). Mason is widely remembered for playing Norman Maine to Judy Garland's Vicky Lester in the remake of A Star is Born (released in October, 1954). Disney hired him to play Captain Nemo in his film of 20,000 Leagues Under the Sea (released in December, 1954). From 1954 to 1955, Mason was the host on the Lux Video Theatre, an anthology show as it moved to NBC from CBS. His smooth suavety was perfect for the villian in Alfred Hitcock's North By Northwest (released in July, 1959) with Cary Grant, and he was also excellent in Journey to the Center of the Earth (released in December, 1959). Mason was so busy that he suffered a heart attack that year, but recovered. Mason starred in more Hollywood-based films at this point, including Heaven Can Wait (which played the Chinese in June, 1978), and The Boys from Brazil (played the Chinese in October, 1978). He starred in the television version of Salem's Lot, which aired in November, 1979 on CBS, and got an Oscar nomination for The Verdict (released in December, 1982), with Paul Newman. He followed this up with the all-star comedy dud Yellowbeard (released in June, 1983). Mason did the narration for two remarkable Kevin Brownlow documentaries, Hollywood, which aired from January to April on ITV, and Unknown Chaplin, aired in January, 1983 on ITV, which allowed Mason to reflect on his long-time next-door neighbor, Chales Chaplin. Mason published his autobiography, Before I Forget in 1981. Mason died of a heart attack in July, 1984. He was 75 years old. His last works were released after his death; the BBC television movie Dr. Fischer of Geneva, which aired in October, 1984, and the film of The Shooting Party (released in February, 1985); his final film was The Assisi Underground (released in May, 1985). Grauman's Chinese Theatre, Hollywood, California. James Mason Forecourt ceremony, Tuesday, March 30, 1954. On a rainy evening, Janet Leigh, James Mason and Victor McLaglen commemorate their working together on Prince Valiant.